What we attempt to achieve, through our winemaking practices, is a balance among the component parts of a wine. The realization of this balance between fruit, acidity, tannin, and alcohol ensures both a wine of finesse and enduring elegance and, quite importantly, a thread of continuity in our style from vintage to vintage. Our commitment to producing a singular Russian River Valley Chardonnay and a singular Alexander Valley Cabernet Sauvignon—each a collection of the best lots of grapes thoughtfully blended to honor the subtleties of old-world wine traditions in France—allows for sharp focus on every detail of winegrowing. 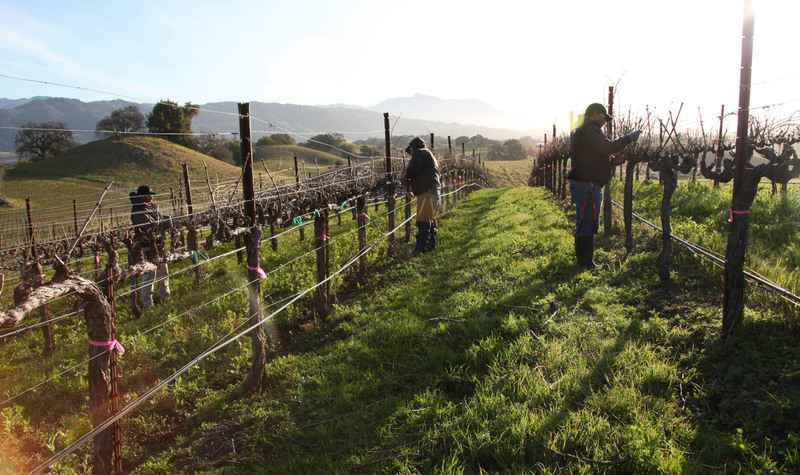 Each year’s vintage reflects a deft winemaking approach that adapts to Mother Nature’s needs, moods and realities throughout the growing season. The result is pristine grape clusters harvested with uniform ripeness at lower sugar levels—the foundation for crafting classic wines that are approachable while young yet still age gracefully. Even after four decades, we refuse to rest on our laurels. John Jordan and Winemaker Rob Davis continue to push the farthest boundaries of winemaking quality with a diverse selection of vineyard blocks, fine-tuned year after year. Honoring the best of France’s winegrowing philosophies, grapes from our estate vineyards and a family of Sonoma County growers receive equal consideration for our master blends. Only the highest-ranking wine lots will be selected for Jordan’s barrel cellar, where a judicious combination of mature and new oak, primarily French, helps Jordan wines achieve our elegant style. The inspiration for Jordan wines include the noted Chardonnay appellations of Meursault and Puligny-Montrachet in Burgundy, and Saint-Julien and Pauillac in Bordeaux, villages known for their silky, Cabernet Sauvignon blends. While current trends in much of winemaking today may focus on recipes for crafting big, powerful wines to garner scores, Jordan remains committed to a timeless style of wine renowned by chefs, sommeliers and consumers alike for its food pairing affinity.